Thursday January 26th 1899 It was a terrible windy mean day. I ironed and did some sewing in the afternoon. The boys could not do much but take care of the stock. 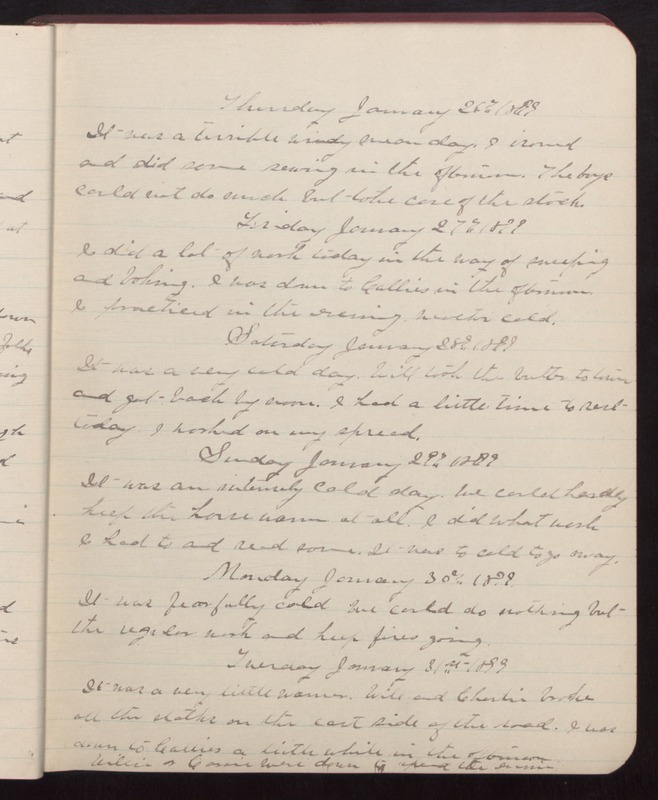 Friday January 27th 1899 I did a lot of work today in the way of sweeping and baking. I was down to Callies in the afternoon and practiced in the evening. Weather cold. Saturday January 28th 1899 It was a very cold day. Will took the butter to town and got back by noon. I had a little time to rest today. I worked on my spread. Sunday January 29th 1899 It was an intensely cold day. We could hardly keep the house warm at all. I did what work I had to and read some. It was to cold to go away. Monday January 30th 1899. It was fearfully cold We could do nothing but the regular work and keep fires going. Tuesday January 31st 1899 It was a very little warmer. Will and Charlie broke all the stalks on the east side of the road. I was down to Callies a little while in the afternoon. Willie and Cassie were down to spend the evening.